Alexander Skinner was born circa 1791. He was the son of John Skinner and Anna Harvey. Mary Creecy was born in November 1806 at Chowan Co., NC. She was the daughter of Nathan Creecy and Elizabeth Rice. Mary Creecy married Henry Augustus Skinner, son of John Skinner and Anna Harvey, on 24 November 1829 at Chowan Co., NC. Mary Creecy died on 19 March 1892 at Mobile, Mobile Co., AL, at age 85. The Economist-Falcon (Elizabeth City, NC), 5 April 1892, page 3, column 3. Departed this life in Mobile Ala. March 19th, in the 86th year of her age, Mrs. Mary C. Skinner, relict of Henry A. Skinner, and the oldest member of the Creecy family of Edenton N. C.
Mrs. Skinner was born in Chowan county, in November 1806 at the farm then and since known as Wakefield, near Albemarle Sound. Upon the death of her father, Nathan Creecy, she removed to Edenton, was married in 1829 and in 1836 removed to Clarke county Ala. and thence to Mobile in 1851. She leaves two surviving children, having lost several by death, her eldest son Joseph at Gettysburg, we think. She was a devoted member of the Catholic Church and was buried from the Catholic Cathedral of Mobile. Nathan was probably the son of Joseph Moore and Nancy. In the 1850 federal census of Concord Township, Highland County, OH, Joseph is listed as 49 and a farmer, born in OH. Nancy is listed as 35 and born in OH. Nathan T. Was listed as 14, born in OH. By the 1860 census, Nathan T. was a 24 year old school teacher living with Thomas Hogan in the Liberty Township, Highland Co. while his father Joseph was still in the Concord Township, age 59, and Nancy age 51. Nathan was a school teacher and traveled from place to place where he would be needed. He was a 'Yankee' and was a soldier in the Union Army. He used to tell endless tales of the Civil War. Claude Jr. remembered him as a tall, proud, sensitive, and gentle man, possessed of a wry sense of humor. He was cultured and well-read, and most intelligent. Nathan was principal of the school in Webb City. Sarah Louisa was a Quaker. Nathan and S.L. were enumerated in the 1880 Fairview, Fayette Co., Indiana federal census. He was a school teacher age 45, she was 36. Children in the household were Viola 14, Emma 9, Harry 7, "Mollie" 3, and Walter 5 months. Nathan and Louisa were enumerated in the 1900 Joplin township, Webb City, Jasper Co., MO, federal census, ED 49, page 7A. Nathan was a teacher, age 65; she was 56. The census indicates he has born October 1834; she was born August 1844. Harry was born October 1879, Nettie January 1880, Jessie March 1882, and Arthur September 1884. Walter was living next door age 29. Nathan and Sarah were enumerated in the 1910 Joplin Township, Webb City, Jasper Co., MO, federal census, ED 60, page 6B. Nathan was retired, age 74. Sarah was 65. Children in the household were Jessie and Arthur. Living next door was a Walter Moore, age 39. Nathan and Sarah Louisa were enumerated in the 1920 Jopln township, Webb City, Jasper Co., MO, federal census, ED 70, page 8B. He was 84, she was 75. Also in the household was their widowed daughter Jessie Lee Lillibridge, age 47 who was a cashier at a theater. He married Sarah Louise Masker, who was born in Fincastle, Brown county, Ohio, August. 5, 1844. and was a mere child at the beginning of the war. Mr. Moore taught in various places, and in 1878, on the 9th day of October, while they were living at Butler, Kentucky, Harry C. Moore was born. Mr. Moore's whole life, with the exception of his four years' military experience, has been spent in the noble work of teaching. Now, in 1911, he has retired from his profession and is living a quiet life with his wife in Webb City, still having an opportunity to instill into his grandchildren's minds the stores of knowledge he accumulated during his years of teaching. 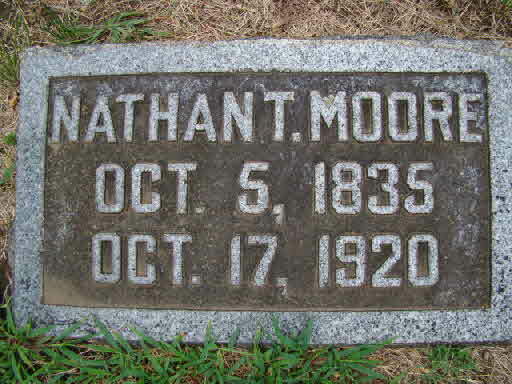 [S807] Find A Grave, online http://www.findagrave.com, Find A Grave, database and images (https://www.findagrave.com : accessed 25 January 2018), memorial page for Nathan T Moore (5 Oct 1835–17 Oct 1920), Find A Grave Memorial no. 55067749, citing Mount Hope Cemetery, Webb City, Jasper County, Missouri, USA ; Maintained by Kelly (contributor 47291356) . Sarah Louisa Manker was born on 2 August 1844 at Fincastle, Brown Co., OH.1 She was the daughter of John Manker and Sarah Wright.2 Sarah Louisa Manker married Nathan Thomas Moore, son of Joseph Marion Moore and Nancy Hathaway, on 24 August 1865 at Mowreystown, Highland Co., OH. Sarah Louisa Manker died on 16 April 1923 at Webb City, Jasper Co., MO, at age 78; of stomach cancer. She was buried on 18 April 1923 at Mount Hope Cemetery, Webb City, Jasper Co., MO.3 Possibly the daughter of John Manker and Sarah Wright who were married March 19, 1824 by Andrew S. McClain, M.G. in Highland Co., OH. They were listed in the 1860 Federal Census of Highland Co. John was age 58, a farmer, born in PA. Sarah was 55, born in PA. Sarah was 16, born in OH. There is another Sarah listed in Liberty Township, the daughter of Jacob and Rebecca but she is listed as "Sarah J." [S807] Find A Grave, online http://www.findagrave.com, memorial # 55067749. [S336] Ancestry.com, Ancestry.com. 1850 United States Federal Census [database on-line]. Provo, UT, USA: Ancestry.com Operations, Inc., 2009. Images reproduced by FamilySearch. Year: 1850; Census Place: Eagle, Brown, Ohio; Roll: M432_662; Page: 429B; Image: 311. 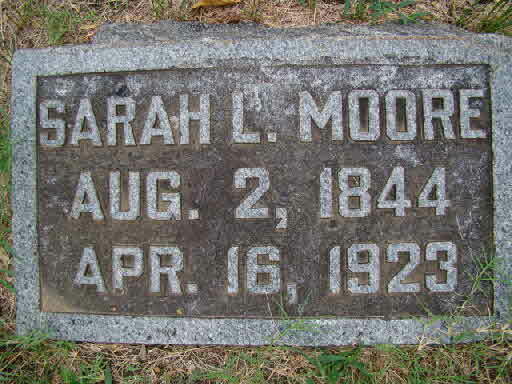 [S807] Find A Grave, online http://www.findagrave.com, Find A Grave, database and images (https://www.findagrave.com : accessed 25 January 2018), memorial page for Sarah Louise Manker Moore (2 Aug 1844–16 Apr 1923), Find A Grave Memorial no. 55067772, citing Mount Hope Cemetery, Webb City, Jasper County, Missouri, USA ; Maintained by Kelly (contributor 47291356) . Viola B. Moore was born on 30 June 1866 at Mowreystown, Highland Co., OH. She was the daughter of Nathan Thomas Moore and Sarah Louisa Manker. Viola B. Moore died on 29 August 1948 at Waxahachie, TX, at age 82; of a stroke. President of the Webb City Bank, retired at 45 wealthy and then traveled. Walter and Cora were enumerated in the 1900 Joplin township, Webb City, Jasper Co., MO, federal census, ED 49, page 7A, living next door to his father. He was a traveling salesman born December 1870, she was born July 1872 in Missouri. Her father was from England, her mother from Missouri. They had been married 6 years and had no children. Walter and Cora were enumerated in teh 1920 Joplin township, Webb City, Jasper Co., MO, federal census, ED 70, page 8B. They lived on South Bell Street, next door to his father. Walter F. Moore was born on 7 December 1869 at Concordia, Lafayette Co., MO. He was the son of Nathan Thomas Moore and Sarah Louisa Manker. Walter F. Moore married Cora (?) Walter F. Moore died on 7 March 1943 at Long Beach, CA, at age 73; of cancer. Frank Emmette Moore was born on 16 November 1873 at Frudam, Lafayette Co., MO. He was the son of Nathan Thomas Moore and Sarah Louisa Manker. Frank Emmette Moore died on 19 June 1874 at Mountain Grove, MO; Accidental Drowning. Nettie Mary Louise Moore was born on 11 January 1880 at Falmouth, Rush Co., IN. She was the daughter of Nathan Thomas Moore and Sarah Louisa Manker. Nettie Mary Louise Moore died on 11 May 1962 at Des Moines, Polk Co., IA, at age 82. [S182] Social Security Death Index (on-line), Ancestry.com, SSDI, Ancestry.com, SSAN 569-26-1664. When he was killed in an auto accident, he was the vice-President fo the Toledo Edison Company, Ohio. Davis Arthur Moore was born on 18 September 1884 at Morris Township, Texas Co., MO. He was the son of Nathan Thomas Moore and Sarah Louisa Manker. Davis Arthur Moore died on 7 June 1952 at age 67. Davis Arthur Moore Jr. d. age 2. Leonard Lillibridge married Jessica Lee Moore, daughter of Nathan Thomas Moore and Sarah Louisa Manker, in 1917. Leonard Lillibridge died in 1918 at Flu Epidemic. Rev. Robert Thomas Chappell was born on 26 April 1863 at Whitaker's Bluff (now Flatwoods), Perry Co., TN.1 He was the son of Thomas Dickie Chappell and Mary A. Lockridge. Rev. Robert Thomas Chappell was baptized in 1879 at Mt. Olive Cumberland Presbyterian Church, Flatwoods, northern Wayne (now Perry) Co., TN. He married Martha Louisa Thomason, daughter of Frances Marion Thomason and Margaret A. Smith, on 23 January 1881 at Flatwoods, northern Wayne Co., TN.2 Rev. Robert Thomas Chappell married Ruth Stone on 6 February 1898 at Wayne Co., TN. Rev. Robert Thomas Chappell died on 30 November 1945 at Boyce Clinic, Hohenwald, Lewis Co., TN, at age 82. He was buried on 2 December 1945 at Cedar Glade Cemetery on the Howell Farm, near the Buffalo River, Flatwoods, northern Wayne County, TN. Robert was still in his mother's household, age 17, in the 1880 census of Wayne Co., TN. His 1st marriage must have then been shortly thereafter as the birth of his first child Mollie, was in October 1881. Robert was enumerated in the 1900 Wayne Co., TN census, 3rd Civil District, age 37, a carpenter, with wife Ruth 26 and children Nina 6, May 11, Dory 8, Mary M. 1, and brother Benjamin 42. Apparently Robert's first wife died and he remarried Ruth. Just for argument sake, Mary M. will be assigned to Ruth. The graves are in very, very, very northern Wayne County. Whitaker's Bluff (renamed Flatwoods in 1871) has always straddled the Wayne and Perry County line. "Most" of Flatwoods was in Wayne County until 1909 when by legislative action, "most" of Flatwoods was moved into Perry County. The county line was moved again slightly just a few years ago, but these two graves have always been in Wayne County. The graves are on a farm. I think that the current farm (where the graves are located) was part of Tom Chappell's much larger farm. Flatwoods was projected to have a railroad come through in the late 1880s-early 1890s. The route was surveyed, and the plans were moving along. The projected route came close to the home of Tom Chappell's widow and was really near the farm where the graves are. "The Cedar Glade" is a specific area adjoining the Buffalo River bank just up from the graves. Bob was the master builder around Flatwoods for many years. Mattie was the daughter of Francis Marion Thomason, a local miller and saw miller. After the 1909 county line change, the Thomasons were still living just inside the Wayne County line on Little 'Possum Creek. Marion Thomason's granddaughter [daughter of Milton Harrison "Milt" Thomason and Alice (Ham) Thomason] still lives on the Thomason family farm property. Alice's family, according to her daughter, pronounced the name "Hom." But by the 1930s, the last name was spelled "Hamm" and pronounced "Ham." Martha Louisa Thomason was born on 23 September 1863 at Little 'Possum Creek, Flatwoods, northern Wayne Co., TN. She was the daughter of Frances Marion Thomason and Margaret A. Smith. Martha Louisa Thomason also went by the name of Mattie Thomason. She married Rev. Robert Thomas Chappell, son of Thomas Dickie Chappell and Mary A. Lockridge, on 23 January 1881 at Flatwoods, northern Wayne Co., TN.1 Martha Louisa Thomason died on 22 May 1896 at Flatwoods, northern Wayne Co., TN, at age 32. Some information on Matie is from the Mount Ollive CP Church journal. Dorothy Chappell was born on 5 August 1891 at Flatwoods, northern Wayne Co., TN. She was the daughter of Rev. Robert Thomas Chappell and Martha Louisa Thomason. Dorothy Chappell also went by the name of Dovie Chappell. She married F. C. Down. Dorothy Chappell died on 3 August 1959 at Dallas, Dallas Co., TX, at age 67. Nina Chappell was born in September 1893 at Flatwoods, northern Wayne Co., TN. She was the daughter of Rev. Robert Thomas Chappell and Martha Louisa Thomason. Nina Chappell died on 26 September 1926 at Flatwoods, northern Wayne Co., TN. The Flatwoods farm had no running water or electricity. Water came from a spring, oil lanterns provided illumination, ice was non-existent, the outhouse was about 50-75 feet from the main house. The kids had a chamberpot for nighttime bathroom relief. They had to empty it every morning. Meat was cured in the smokehouse and chickens were slaughtered on an almost daily basis. Going into town required harnessing up the mule to a buckboard and fording the local stream/river which backed up to the property. Mollie and Thomas were enumerated in the 1920 Wayne Co., TN, federal census. He was a farmer, age 46, she was 38. Children in the household were Robert J. 15, Mattie C. 14, Roy T. 9, and Laury L. 6. They were again enumerated in Wayne Co. in the 1930 census. Children in the household were Robert, Roy, and Lucile. They were still in Wayne Co. in the 1940 census. The only child in the household was Robert. Roy and his wife Louise were enumerated next door. NOTE: The farm was located in Wayne County, the nearby cemetery, located in front of the Methodist church, is in Perry County. [S807] Find A Grave, online http://www.findagrave.com, memorial ID 39151064. Thomas D. and Mary A. were enumerated in the 1850 Franklin Co., TN census; also in the household were William D., 6, Susan A. V., 5, and Fanny G., 2. Thomas and Mary A. were enumerated in the 1860 Perry Co., TN census; Thomas 48, Mary 39; Richard 16, Susan A. 14, Frances 12, Nimrod 10, Mary V. 6, Etta 4, Benjamin 1, with 7 slaves. Thomas D. and Mary A. were enumerated in the 1870 Wayne Co., TN census. Thomas 50, Mary 50, Fannie 21, Nimrod 18, Mary V. 16, Ella B. 12, Benjamin F. 10, Robert P. 7. Mary A. was enumerated in the 1880 Wayne Co., TN census, age 60; Ben 20, Robert 17. Also in the household was Thomas Lockridge 45. Perhaps Thomas was deceased by this time. Mary A. Lockridge was born say 1821. She married Thomas Dickie Chappell, son of William Chappell Junior and Sarah L. Palmer, in 1840. William Chappell Junior was born on 29 July 1788 at Halifax Co., VA.1 He was the son of William Chappell and Elizabeth Dickey. William Chappell Junior married Sarah L. Palmer on 25 June 1812 at Halifax Co., VA.2 William Chappell Junior died on 21 November 1873 at Maury Co., TN, at age 85. William and Sarah were enumerated in the 1850 Maury Co. census. William was 62 born in VA; Sarah was 53, born in VA. Also in the household are William B., 22, Alexander, 16, Sallie L., 14, Newton P., 10. [S348] Phil E. Chappell, Chappell-Dickie, Page 125. Sarah L. Palmer was born on 9 May 1798. She married William Chappell Junior, son of William Chappell and Elizabeth Dickey, on 25 June 1812 at Halifax Co., VA.1 Sarah L. Palmer died on 17 October 1852 at age 54. William Chappell was born on 15 May 1758 at Amelia Co., VA.1,2 He was the son of John Chappell and Prudence (?) William Chappell married Elizabeth Dickey, daughter of John Dickie, on 6 November 1783 at Halifax Co., VA. William Chappell died on 18 May 1799 at Halifax Co., VA, at age 41. [S350] Phil E. Chappell, Chappell Revised, Page 238. [S350] Phil E. Chappell, Chappell Revised, page 239. [S350] Phil E. Chappell, Chappell Revised, page 240. John Chappell was born in 1720 at Prince George, VA. He was the son of Robert Chappell and Sarah Cox. John Chappell married Prudence (?) John Chappell died in April 1775 at Amelia Co., VA.
Prudence (?) married John Chappell, son of Robert Chappell and Sarah Cox. Prudence (?) died in 1778. Robert Chappell was born in 1680 at Charles City Co., VA.1 He was the son of Thomas Chappell and Elizabeth Jones. Robert Chappell married Sarah Cox. Robert Chappell died in 1724 at Prince George, VA.
[S350] Phil E. Chappell, Chappell Revised, Page 158. [S350] Phil E. Chappell, Chappell Revised, Page 166. Thomas Chappell was born in 1650 at Charles City Co., VA.1 He was the son of Thomas Chappell and perhaps Mary Sarah Banister. Thomas Chappell died between 1694 and 1700 at Charles City Co., VA.
[S350] Phil E. Chappell, Chappell Revised, Page 60. Thomas Chappell was born in 1612 at Gravesend, England.1 He died after 1665 at Charles City Co. Va.
[S350] Phil E. Chappell, Chappell Revised, Page 50. WOLFE J. Frank, Jr., a long time resident of Oklahoma City, passed away Thursday, March 5, in Houston, Texas at the age of 88. Frank was born June 26, 1909 in Nashville, Tennessee. While attending Southern Methodist University, he became a member of Sigma Alpha Epsilon Fraternity. He subsequently went into the food brokerage business with his father and they founded the firm, J. Frank Wolfe & Son. The firm moved to Oklahoma City in 1934. When his father died in 1942, Frank took over the business and J. Frank Wolfe, Food Broker, operated for the next 40 years in Oklahoma City. His interest and love for the food brokerage business never declined and he remained active in consulting roles until the age of 83. During all of his business life, he supported and participated in the Downtown Rotary Club 29, and was a member of Crown Heights United Methodist Church. Though not a musician, Frank loved popular music. He collected records and tapes and knew all the songs. He also loved sailboating, and was an accomplished private pilot, with his own airplane in the late 1940's. But more than anything, Frank was one of those rare people who was liked by everyone who came in contact with him. He was held in utmost respect by friends developed through both business and personal relationships. Frank was pre-deceased by his second wife, Hyacinth Bynum Wolfe, and is survived by his two children, J. Frank Wolfe, III of Houston, Texas and Mary Louise Ruck of Las Vegas, Nevada. He has five grandchildren, David Wolfe in Dallas, Texas, Karen Doyle in Kingwood, Texas, Carol Southern in Houston, Texas, James Germany in Denver, Colorado, and Jerry Germany in Las Vegas, Nevada. Frank also has seven great-grandchildren. J. Frank Jr. and Louise M. were enumerated in the 1940 Oklahoma City, Oklahoma Co., OK, federal census. He was the owner of a food brokerage age 30, she was 29. Childdren in the household were J. Frank III 6, and Mary Louise 5. [S182] Social Security Death Index (on-line), Ancestry.com, SSDI, Ancestry.com, SSAN 440-01-8564. [S807] Find A Grave, online http://www.findagrave.com, Find A Grave, database and images (https://www.findagrave.com : accessed 20 August 2018), memorial page for James Frank Wolfe, Jr (26 Jun 1909–5 Mar 1998), Find A Grave Memorial no. 33036271, citing Rose Hill Burial Park, Oklahoma City, Oklahoma County, Oklahoma, USA ; Maintained by Sharon Atkinson McClelland (contributor 46836997) . George Woodward Jr. was born on 26 February 1907 at Oklahoma City, Oklahoma Co., OK. He married Dorothy Louise Moore, daughter of Harry Claude Moore and Valera Mae Chappell, on 29 December 1963 at Oklahoma City, Oklahoma Co., OK. George Woodward Jr. died on 14 September 1985 at at Sea, Queen Elizabeth II, at age 78. He was buried at Fairlawn Cemetery, Oklahoma City, Oklahoma Co., OK.
Frank W. Danglade married Valera Mae Chappell, daughter of Rev. Robert Thomas Chappell and Martha Louisa Thomason. [S807] Find A Grave, online http://www.findagrave.com, Find A Grave, database and images (https://www.findagrave.com : accessed 12 February 2018), memorial page for Lemuel E. Alsup (1858–1896), Find A Grave Memorial no. 46359249, citing North Belton Cemetery, Belton, Bell County, Texas, USA ; Maintained by SFC Frank Irons Sr. Retired US Army 1977 (contributor 46510193) . Annie was enumerated in the 1910 Belton, Bell Co., TX, federal census living in the household of her mother. She was 45; Nannie M. was 22, Z. Tallie was 20. [S807] Find A Grave, online http://www.findagrave.com, Find A Grave, database and images (https://www.findagrave.com : accessed 12 February 2018), memorial page for Annie Lee Carpenter Alsup (4 Jul 1878–27 Dec 1956), Find A Grave Memorial no. 28269818, citing North Belton Cemetery, Belton, Bell County, Texas, USA ; Maintained by Reba Alsup (contributor 46515710) . Jess and Nannie M. were enumerated in the 1920 Dallas, Dallas Co., TX, federal census (ED 76, page 6A). He was 33, office manager of a furniture company; she was 28. Jess Jr. was the only child in the household, age 4 2/12. Mother-in-law Annie Alsup, age 49, was also in the household. In the 1910 census Nannie Mae had been 22. Jess and Nan were enumerated in the 1930, Dallas, Dallas Co., TX, federal census (ED 91, page 29A). He was 43, secretary of a furnature company; she was 39. Children in the household were J.O. Jr. 14, and Billy 5. Mother-in-law Mrs. Annie Alsup, age 60, was also in the household. [S182] Social Security Death Index (on-line), Ancestry.com, SSDI, Ancestry.com, SSAN 456-17-8584. [S807] Find A Grave, online http://www.findagrave.com, Find A Grave, database and images (https://www.findagrave.com : accessed 12 February 2018), memorial page for Nannie Mae Alsup Yeargan (30 Jun 1888–21 Sep 1972), Find A Grave Memorial no. 47028083, citing Restland Memorial Park, Dallas, Dallas County, Texas, USA ; Maintained by Reba Alsup (contributor 46515710) . "T.F." and "Mollie M." were enumerated in the 1880 District 1, Precinct 1, Bell Co., TX, federal census. He was a farmer age 37, she was 33. Children in the household were Annie Lee 12, Sallie 10, Mary R. 8, E. Ruth 6, Wm. Ben. 4, and Alma Browne 3. 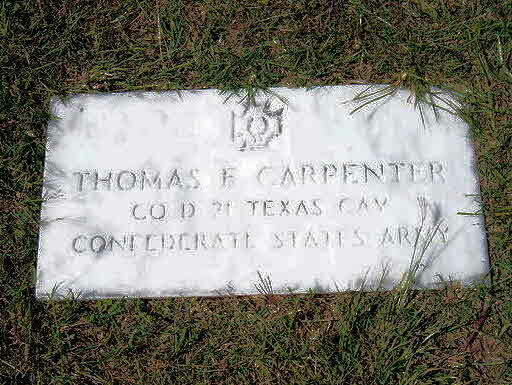 From unmarked newspaper: "Thomas Fletcher Carpenter was the fourth son of Rev. John and Elizabeth Carpenter. "He was born in Simpson County, Kentucky, August 19, 1842, and died at this home near Belton, March 24, 1909. In 1852 he, with his parents, eight brothers and sisters and a large colony of other relatives and friends, eighty in number, came overland to the Lone Star State, to seek homes beneath her sunny skies. They settled in Bell County, four miles east of Belton, and to this home many a weary traveler made his way towards the close of day to spend the night, beneath their roof and enjoy their hospitality. "Here Mr. Carpenter grew to manhood and there he formed acquaintances and made true friends, that were his all through life, and many of them stood beside his bier when the last sad rites were performed. "He enlisted in the war in 1862, was in Company D, 21st Texas Cavalry. He was a brave soldier and remained in the service, fighting for Sunny southland he loved so dearly, until the close. When the war was over he went back to the old farm home and took up the daily pursuits of life. On September 6th, 1866, he was married to Miss Mary Lee, daughter of Ed F. and Rebecca Lee, at their suburban home in Belton. This union was blessed with twelve children, ten of whom with their mother and grand children also one brother and three sisters, and a host of relatives survive him. "Mr. Carpenter was a staunch Methodist and enjoyed the religion he professed. It was ever his greatest privilege and his keenest pleasure to work for the Master and attend the protracted camp meetings. Their home was always thrown open on these occasions. He and his noble wife would entertain all who came. "Indeed this home is noted for its true Southern hospitality, it was during one of these meetings in 1882 that his conversion dates from. Long after the midnight hour, when all but he were sleeping soundly, the family and guests were awakened with shouts of praise and in that quiet country home, when all nature was at rest, when none but God was near, he gave himself to the God . . . . "
[S807] Find A Grave, online http://www.findagrave.com, Find A Grave, database and images (https://www.findagrave.com : accessed 12 February 2018), memorial page for Pvt Thomas Fletcher Carpenter (1842–1909), Find A Grave Memorial no. 11017363, citing South Belton Cemetery, Belton, Bell County, Texas, USA ; Maintained by SFC Frank Irons Sr. Retired US Army 1977 (contributor 46510193) . [S807] Find A Grave, online http://www.findagrave.com, Find A Grave, database and images (https://www.findagrave.com : accessed 12 February 2018), memorial page for Mary M. Carpenter (14 Sep 1847–19 Feb 1932), Find A Grave Memorial no. 30892955, citing South Belton Cemetery, Belton, Bell County, Texas, USA ; Maintained by SFC Frank Irons Sr. Retired US Army 1977 (contributor 46510193) .